DERRY -- Last year, Command Sgt. Major Peter K. Chase of Derry missed West Running Brook Middle School’s annual veterans breakfast, but for good reason — he was deployed to Iraq. Chase said the West Running Brook community embraced his family, including his two daughters in middle school, during his deployment with the 101st Engineer Battalion out of Methuen, Mass. So when Chase was asked to be the guest speaker at this year’s veterans event, he said it held special meaning for him. During the fourth annual veterans breakfast on Wednesday, Chase addressed a crowd of several hundred, including the more than 100 veterans and active service members in attendance. And his words rang true throughout the morning, as veterans across generations and their families shared food and camaraderie in the school’s gymnasium. Wednesday marked the first breakfast for Gary Kenefick, formerly of Derry, who drove up from Cape Cod, Mass., to spend the morning with his nephew, 11-year-old Ryan Breen of Derry. Thirteen-year-old Thomas Gillespie has invited his grandfather Jerry Gillespie of Londonderry to the event for the past three years. But for the elder Gillespie, the breakfast is also just a time to spend with his grandson. 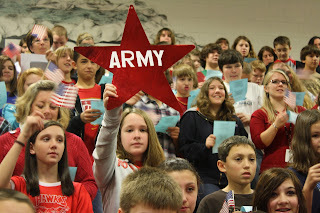 After the breakfast concluded, students and staff presented a series of tributes to veterans, including several readings and songs. Vietnam War veterans were singled out several times throughout the morning, as speakers acknowledged what they called a lack of support for service members returning home from war in the 1960s and '70s. Andy Hamelin, a Vietnam-era Marine and West Running Brook custodian, said he, too, found the specific recognition meaningful. “It kind of just says to us that we’re not second-class citizens, which is what some of us felt coming back,” said Hamelin, of Derry. 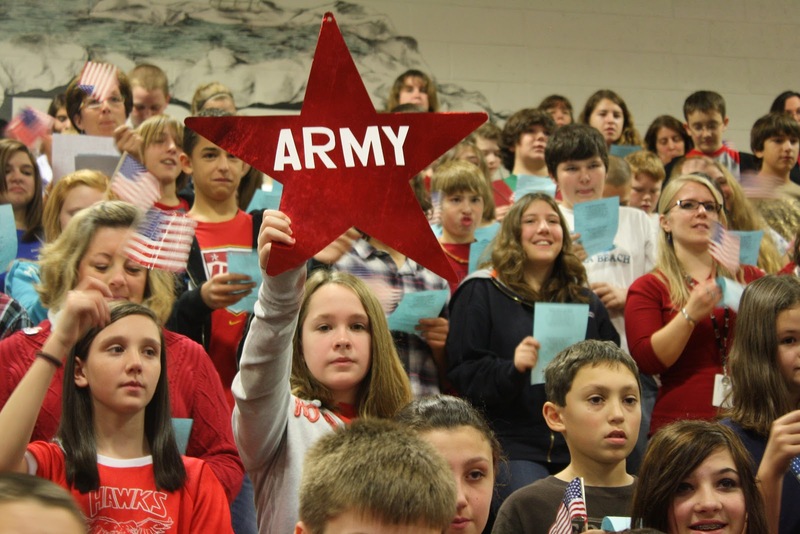 And West Running Brook Principal Leslie Saucier said she hopes events like the annual veterans breakfast will help to carry that sentiment beyond just Veterans Day each year.